We broke in the new shop with our grand re-opening concert a few weeks ago, so it's about time for another party! 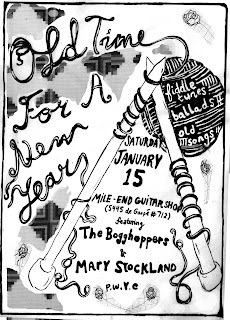 Come join us for a night of fiddle tunes, ballads, old time songs and original music performed by Montreal's finest ballad singer Mary Stockland and old time stringband The Bogghoppers. Mary has an absolutely incredible voice that'll leave you weak in the knees and the Bogghoppers burn through old time music like it's hot off the presses! (I know that metaphor doesn't really make sense -- just trust me that they're GREAT!). This is a pay-what-you-can event and doors will open at 8:30 with music getting started at 9:30.